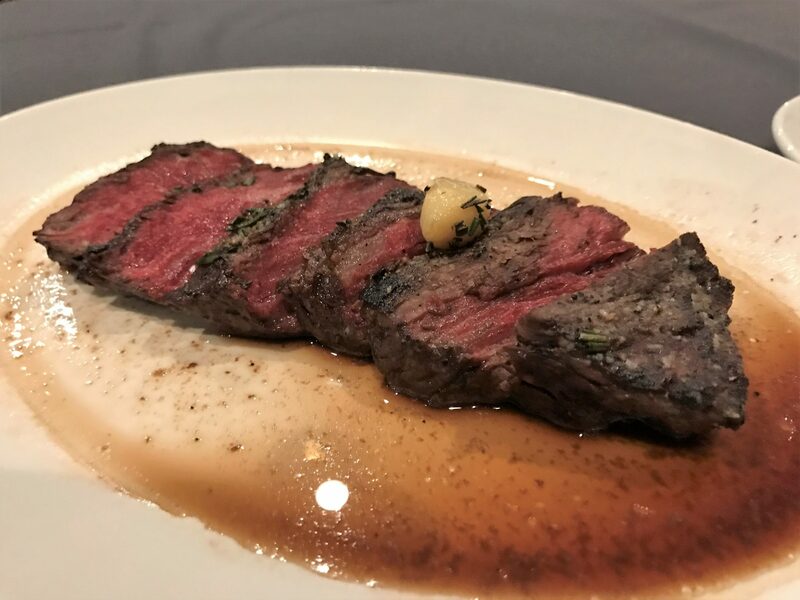 One of the largest holes in the Jacksonville dining scene over the last few years has been the lack of a locally owned steakhouse that offers an elevated experience. Cowford Chophouse has emerged to fill that void. Boasting the city’s most expensive menu and quite possibly the city’s most expensive restaurant build out as well, the restaurant has emerged to set the bar for steak in Jacksonville. The space is breathtaking with many subtle nods to the history of Jacksonville. The rooftop bar which features its own bar menu is a perfect spot to enjoy the sunset. Cowford is well on its way to elevating steakhouse dining in Jax. 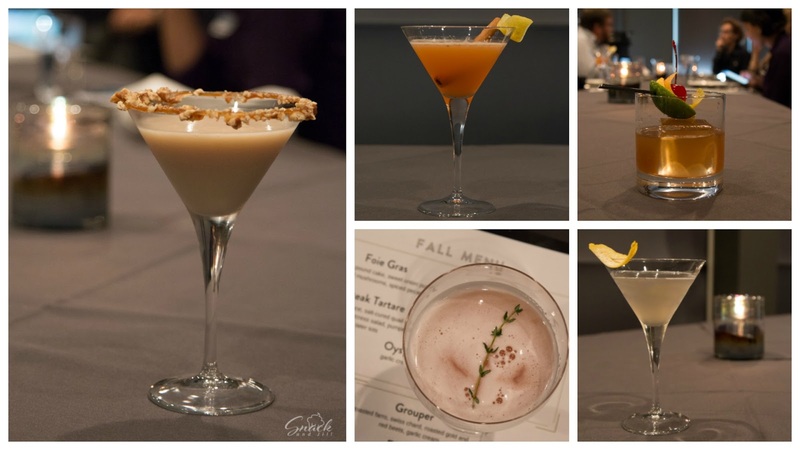 In this article we’re delighted to share with you a look at the new fall menu at Cowford. Toasts have become a fun and light way to start off a meal. 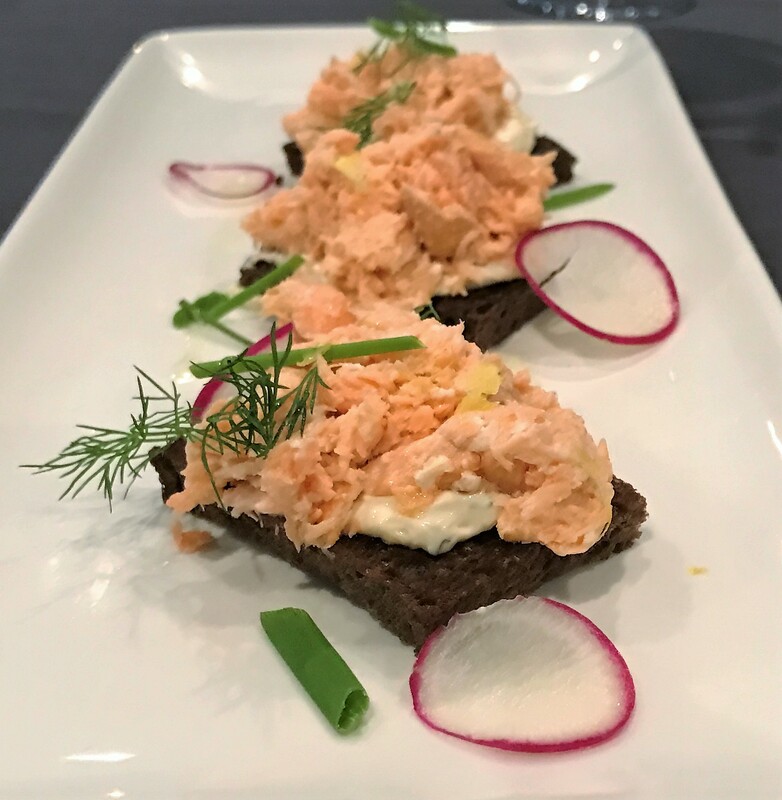 The new Cowford menu offers a Salmon toast served on pumpernickel with a cream cheese based spread, challots, dill, lemon zest, lemon oil and radish. This is a pleasing way for a seafood lover to kick off a meal. The layering of flavors was subtle and enjoyable. The lemon flavor really comes through without being overwhelming. One of the classic steakhouse appetizers is the steak tartare. Cowford’s is more complex than most with a red onion and watercress salad, pumpernickel bread, with a salt-cured quail egg on top. It’s served with a side of tater tots. We thought it was delightful. I can’t imagine any steak tartare fan who wouldn’t enjoy this one. If you don’t eat red meat or maybe your significant other doesn’t, the fall menu offers plenty of wonderful seafood options to choose from. One of the starters that is a fish house mainstay and has quickly become a steakhouse mainstay as well is oysters rockefeller. Cowford serves theirs with garlic cream, sauteed spinach, and nduja (spreadable sausage). These were very well prepared and will surely be a crowd pleaser. The most indulgent app on offer at Cowford has to be the foie gras. 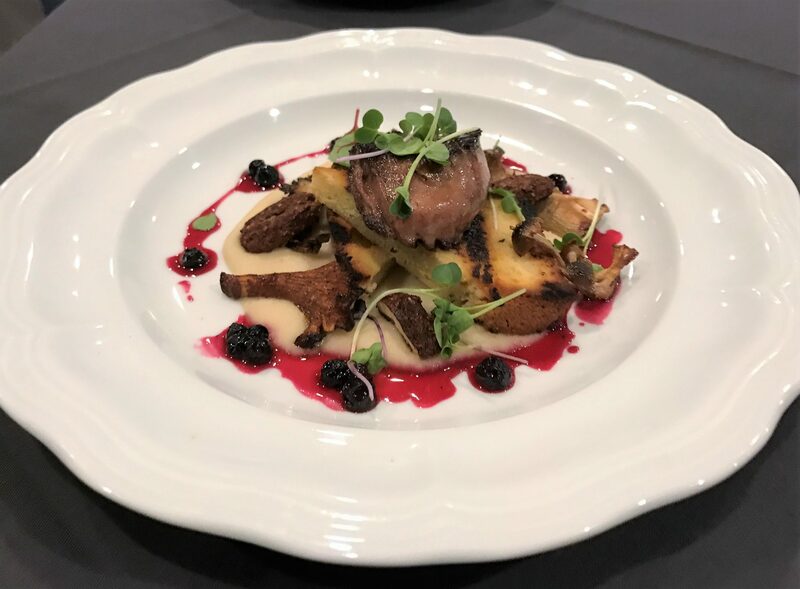 Cowford’s version arrives to your table atop rosemary pound cake, with sweet onion puree, huckleberry gastrique, foraged mushrooms, and spiced pecans. The rosemary pound cake might just be the best thing on the fall menu and would be a delectable dish in a larger version all to itself. The fish fish of the day varies based on what is available fresh. On the day we had the opportunity to try this dish the fish of the day was halibut. It was served with sauce meuniere, haricot verts, olive gremolata, and root vegetable puree. The olive gremolata really makes this dish pop. If you’re an olive lover like me you’ll absolutely love this dish. The fish available on the every day menu at Cowford is grouper. 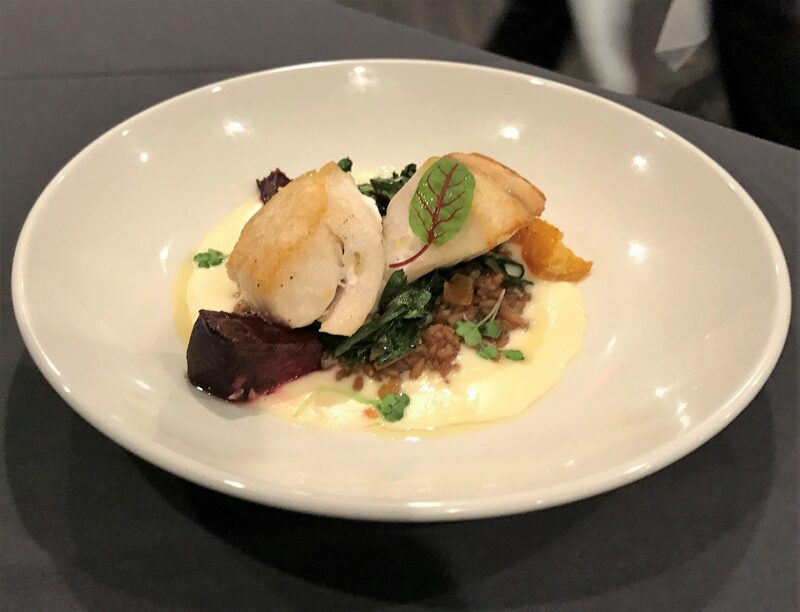 The grouper is served with toasted farro, swiss chard, roasted gold and red beets, and garlic cream. If you’re really in the mood for grouper or prefer earthier tastes this dish might be a good fit for you. 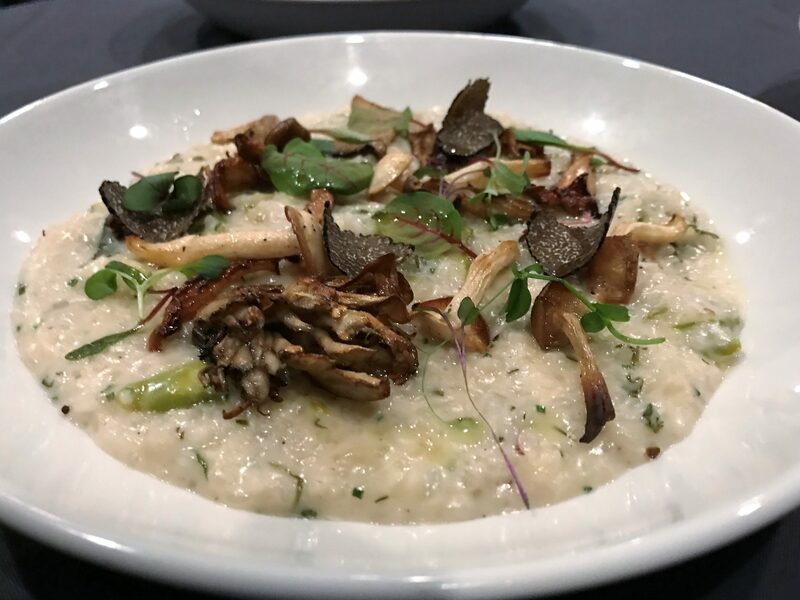 Vegeterians will love the risotto at Cowford Chophouse. The dish comes loaded with foraged mushrooms plus black truffles, asparagus, and parmigiano-reggiano. Even if you’re not a vegetarian and you’re just not feeling the meat on your visit this is a great choice. We’d be remiss if we talked about the city’s new premier steakhouse and didn’t discuss the beef. Cowford offers all the standard cuts you’d expect plus a few you will only see on the menu at the finest steakhouses. The Cowford cut that Jax diners have been raving about and we’ve fallen in love with is the spinalis. The spinalis is the choicest portion of the ribeye. Why eat a standard ribeye when you can have only the best? 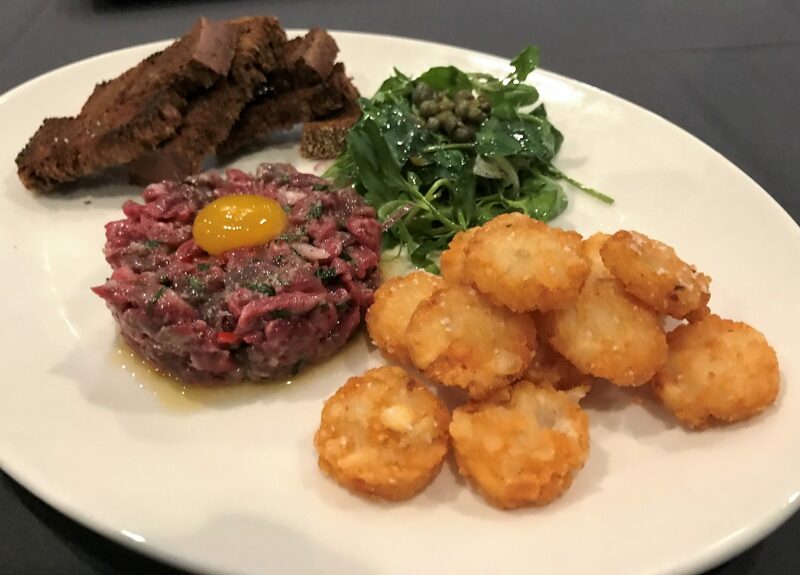 At the fall menu tasting we were invited to try the choicest version of the choicest cut the American Wagyu Spinalis from “Snake River Farms” (8oz. For $85). This meat is incredibly flavorful and tender. It really puts typical ribeyes to shame. Each bite had the melt in your mouth quality the high quality wagyu exudes while being a little less overwhelming and filling than wagyu filets can sometimes be. While 4 or 5 ounces is about all the wagyu filet I can handle I think 8 ounces of wagyu spinalis seems pretty perfect. One of the newer offerings at Cowford is A5 Japanese wagyu ($85 for 4oz). Outside of true Kobe this is the absolute best of the best. If you’ve never had it and you love truly indulgent foods this should be your next special occasion splurge. We didn’t go that crazy on this opportunity but we’ll definitely be back to dive into some A5 the next time we have something big to celebrate. While Cowford may have had some hiccups out of the gate they now seem to be getting their feet under them and be well on their way to taking their place as the restaurant the food community always hoped they would be. This city needs that great business dinner restaurant in downtown. We need a place where the city’s elite can gather and impress. We were impressed during this dive into the new fall menu and we’ll be keeping our eye on Cowford as it grows into something special in the months and years to come. Tagged Bar, Date Night, Dinner, fine dining, Full Bar, lunch, outdoor seating, rooftop, seafood, special occasion, steak, Steakhouse, Vegetarian Friendly. Bookmark the permalink.